Excerpt from an advertisement for Simpsons deparment store, the Globe, October 16, 1929. In the next war, death will be dealt out not only on the battlefield, destruction will rise from the bottom of the sea, destruction will descend from the heavens themselves; destruction will meet your wives, your children, your own. The civilian population left miles and miles and miles away back from the front—destruction will meet those silently, and they will be touched by the mysterious breath of poison and in a mysterious way they will drop down in the middle of your streets and die. 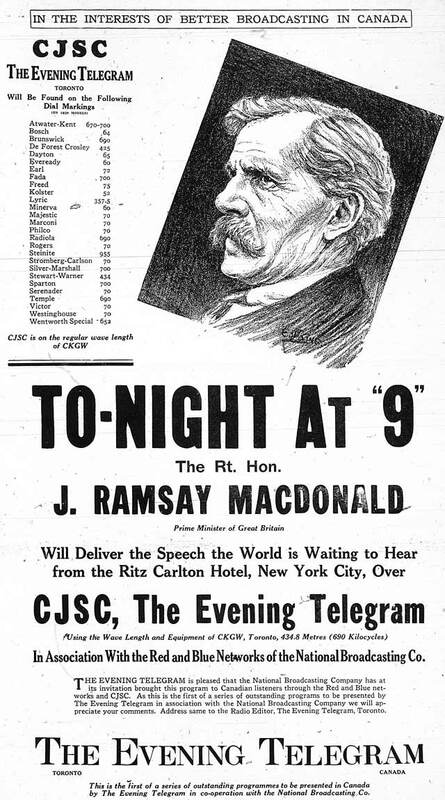 MacDonald declared himself a missionary of peace, one who, especially regarding the United States, had “come over to try to close old chapters of historical suspicion.” A few hours later, he gave a similar address to a Canadian Club luncheon. 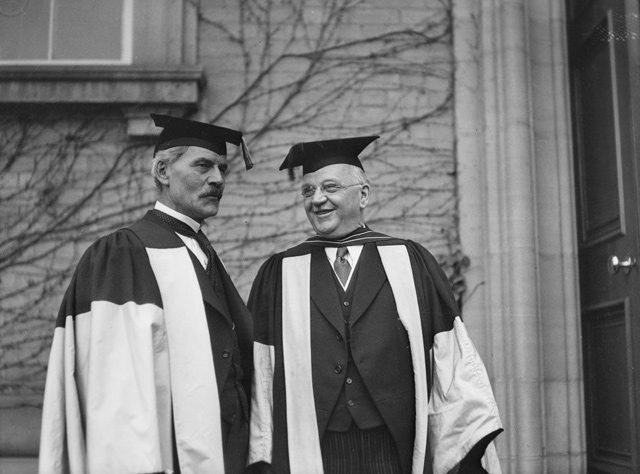 Ramsay MacDonald and Ontario Premier Howard Ferguson at the University of Toronto, October 16, 1929. City of Toronto Archives, Globe and Mail fonds, Fonds 1266, Item 18413. Source: the Telegram, October 16, 1929. 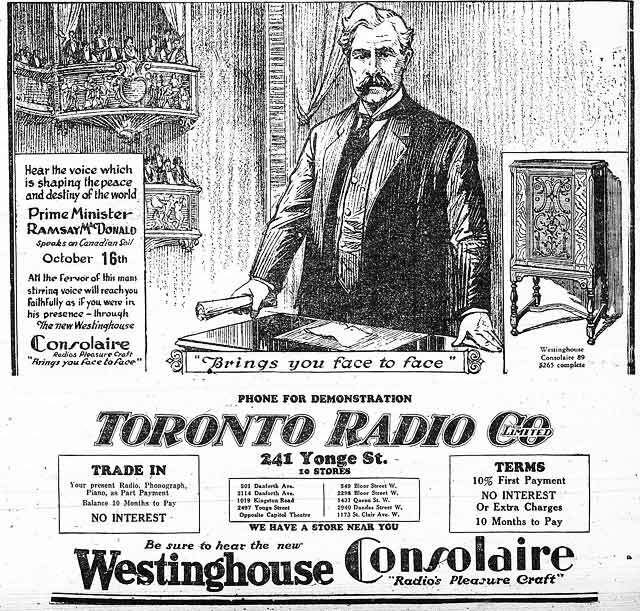 The high number of broadcasts associated with MacDonald’s visit, including many speeches aired on CFRB, was an element local radio retailers couldn’t resist exploiting. Last on the day’s agenda was a men-only dinner held at Government House, the lieutenant-governor’s residence which stood in present-day Chorley Park. This ruled out the presence of his daughter Ishbel, who had accompanied him on the trip and spent her time in Toronto addressing women’s groups on labour and social issues. At midnight, MacDonald’s train rolled out of Union en route to Ottawa. 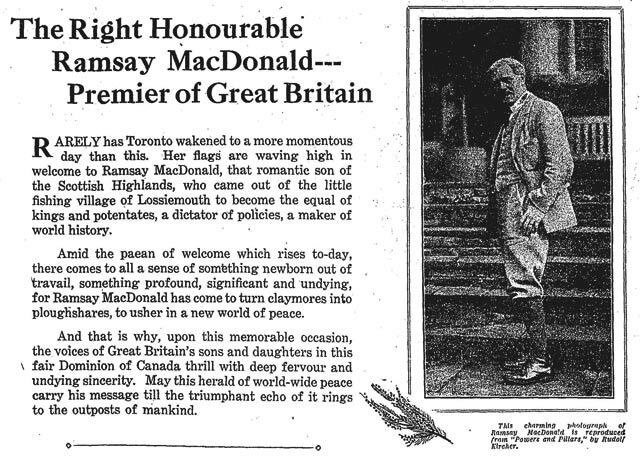 Summing up MacDonald’s visit, the Globe observed that he must have realized “that no British Prime Minister could spend a restful day in Toronto, none less than a Premier giving immediate and particular thought to the possibilities and reactions of international association.” Unfortunately, the decade ahead would dash his dreams of preventing a global catastrophe on the scale of the First World War. Additional material from the October 11, 1929, October 16, 1929, and October 17, 1929 editions of the Globe; the October 16, 1929 and October 17, 1929 editions of the Toronto Star; and the October 12, 1929 and October 16, 1929 editions of the Telegram.